The multiple choice test is the test of preference for some people because the answer is right there in front of you. Of course, several wrong answers are also there and the way a good multiple choice is framed it can be much more difficult to correctly answer the question than a fill-in-the-blank. Some secrets are known by those who construct those multiple choice test that can be of great value to test takers who know them, however. The very first tip you need to know about taking multiple choice tests is that it benefits you to answer the questions you are absolutely sure about first. The downside to this kind of test is that you can spend an inordinate amount of time trying to guess the more difficult ones and if you go in order you may never get to the questions near the bottom. Nearly every multiple choice question will have one answer that is quite obviously wrong. In the case of those with four answers, you will probably be able to immediately eliminate two of the answers. The remaining two answers, however, are likely to both sound very much like a correct choice. The best thing to do is determine whether these two choices fully answer the question. Very often one of the correct-sounding choices only answers part of the question. Another thing to look for is a trick in the wrong answer such as transposed number or letters. Never leave this kind of question unanswered if there is no penalty for guessing because even a guess gives you 50/50 odds. 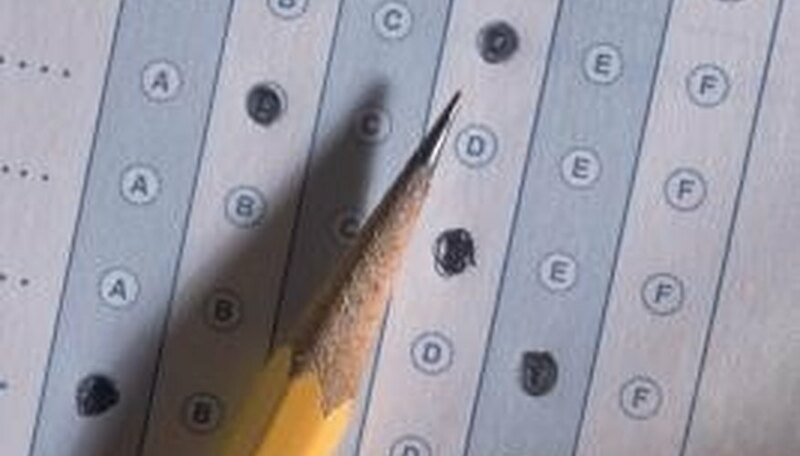 Taking a multiple choice test using an answer sheet in which you trace in a bubble presents its own unique difficulty. Always make sure you are paying attention to what you are doing and always go back over the answer sheet before you turn it in. All those bubbles and numbers can wreak havoc on your perception, and if you accidentally miss just one row it throws every answer following that one off. The quickest way to get a terrifying grade on this kind of test is to unwittingly fill in the wrong answer on nearly every question because you missed one row of bubbles or filled that row in twice for two different questions. The best way to attack a question that has either an "all of the above" or "none of the above" potential is to judge each answer on its own as a true or false equation. If two of the questions can be answered in such a way that they fit the all or none condition, then chances are that all of the other choices do as well. Even if you aren't sure whether all or none are actually true, if you can determine that two of the answers fit the bill, then most likely they all do and it will be safe to choose all or none of the above. Sexton, Timothy. "Tips on Answering Multiple Choice Questions." Sciencing, https://sciencing.com/tips-answering-multiple-choice-questions-5375891.html. 24 April 2017.